Brisbane, QLD. 5th June 2015. Highway 1. The Mother Road. In America the Mother Road is the fond nickname given to Route 66. I’ve discovered that many countries seem to have one. A road that everyone knows, uses at times, and relates to always. In Russia it’s the Trans-Siberian Highway, running from Moscow to Vladivostok. 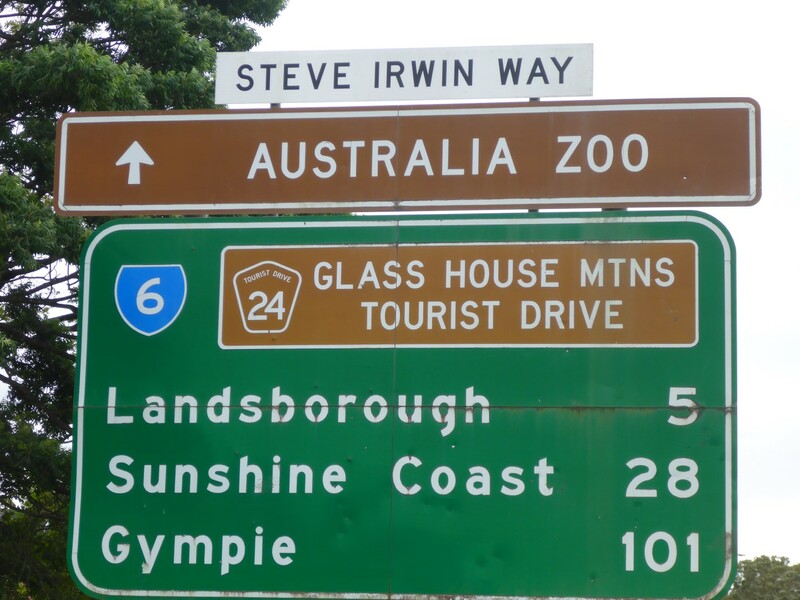 In Australia it’s Highway 1, which circles the country, connecting all state capitals, and is much loved by ‘grey nomads’, with their big 4×4’s and caravans. It truly is a ‘mother’ of a road. At 14,500 kilometres it’s nearly four times longer than Route 66 (3,900kms) and 3,000 kms longer than Russia’s best effort. The world’s longest road, in fact. It will be a constant reference point for me, even though I probably won’t quite ride all of it. 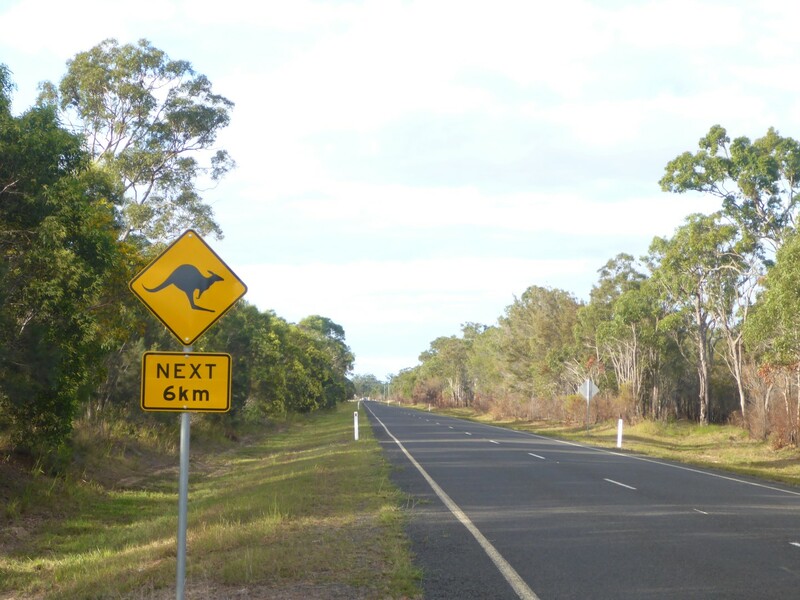 On its journey through Queensland it’s called The Bruce Highway. Nonetheless it was time to start. So what I did next was to ride west instead of north, completely ignoring it. Craig. A lucky meeting thanks to Johnny Depp. When I wheeled my bike out of Phil’s garage petrol leaked out as soon as I turned the tap on. Thankfully it wasn’t the float needle again but a leaky pipe. Easily fixed and I set off for Beenleigh to meet Craig, the Face Book friend who’d put up his selfie with Johnny Depp. Craig had come to Australia from England aged eighteen and simply didn’t go home again. He works as a satellite engineer for Telstra, the biggest phone company in Australia. His work takes him all over the country and he is a keen 4×4 explorer. 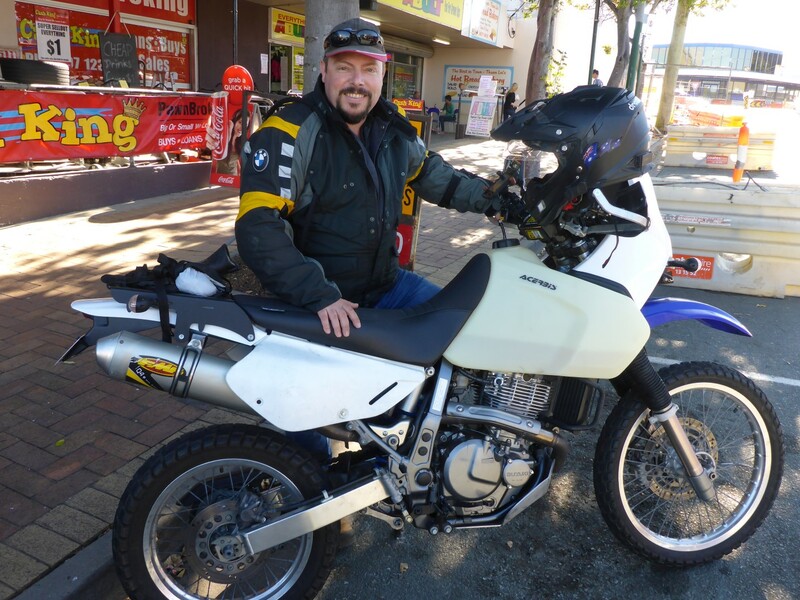 Recently he passed his bike test and he now has a Suzuki DR650, which he’ll use for some adventure travel. He was full of information about places to visit and routes to take. He’s a very enthusiastic guy and I’m sure he’ll have a great time exploring on his bike. I needed to get some supplies and went to the local Woolworths. By the time I’d finished there it was 15.45 and I needed to get going. I’d hung around too long. Where was I going? West, over to the town of Crows Nest. I was visiting Jim, the guy I’d met at Phil’s father-in-law’s lunch. He’d invited me to stay and I rarely say no to that. But 184kms lay before me and it tended to get dark, and cold, well before 6pm. 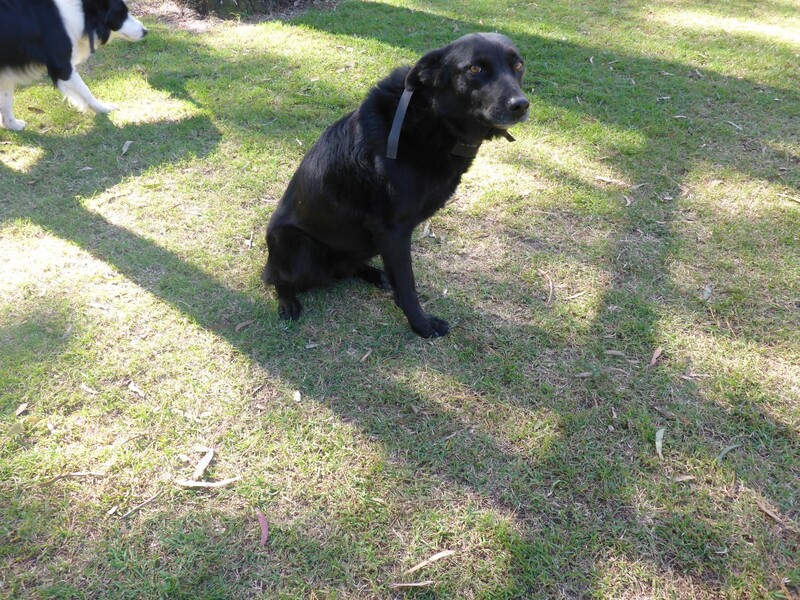 Poor Jessie got his leg caught in a Dingo trap. I entered Jim’s address into my GPS, selected ‘Fastest Route’ and got cracking. Thanks to the motorway, albeit some of it tolled, I made it there by 17.15. Pretty good going. Jim welcomed me, introduced me to Jeanette, his wife, and we all sat down to talk. 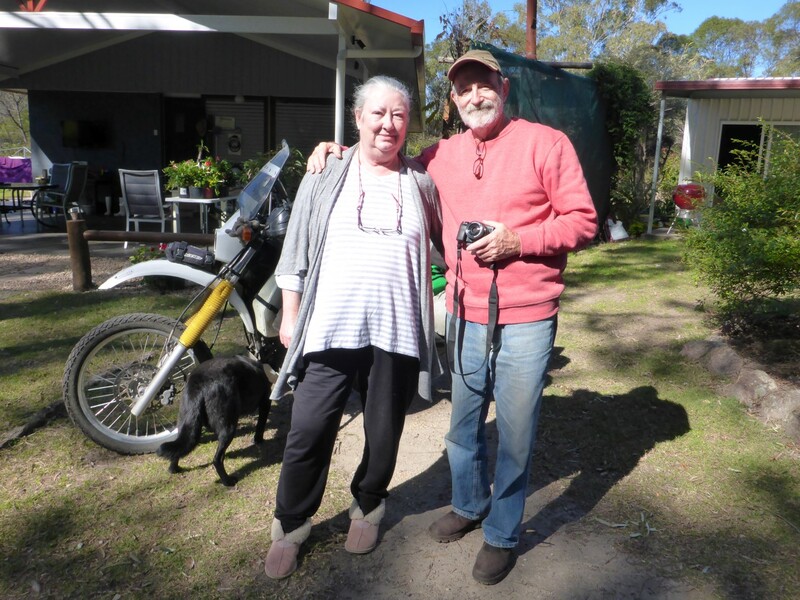 Before long they were telling tales of their camping holidays up at Cape York, in the deserts and in the National Parks. Their knowledge is vast and I was wishing I had the aural equivalent of a photographic memory. In Brisbane I had bought a Michelin map of Australia, which is surprisingly detailed and is excellent for route planning. I marked down some of the places they were telling me about with a view to including them on my visit list. One very useful thing Jim put me onto was a mapping programme called Ozi Explorer. I copied the software onto my laptop, later updating it via a download site. It has several different varieties of maps and is interactive. As well as having search facilities and so on, the maps allow me to place waypoints on them, form those into a route and then copy that across to my GPS. This is a fantastic facility and means I can create a route to anything that is shown on these maps. GPS mapping is generally geared up to street addresses, although they do include points of interest such as fuel stations. But my free-from-the-internet maps don’t show places such as tourist sites, camp grounds etc. But now, I have the technology. Thanks Jim! Although the night was cold – five degrees lower than the coast, Jim announced – the daytime was sunny and warm and Jim and I went for a walk. His property covers one hundred acres, all woodland, and Jim spends much his time looking after it. He thins out trees, does his best to eliminate a bush called Lantana, a pest plant, and generally helps the natural woodland to flourish. They live off-grid, apart from their phone line, and have solar PV and solar thermal to provide power and hot water. Heating is from a wood stove, naturally, and water comes from rain, stored in two tanks and filtered before use. 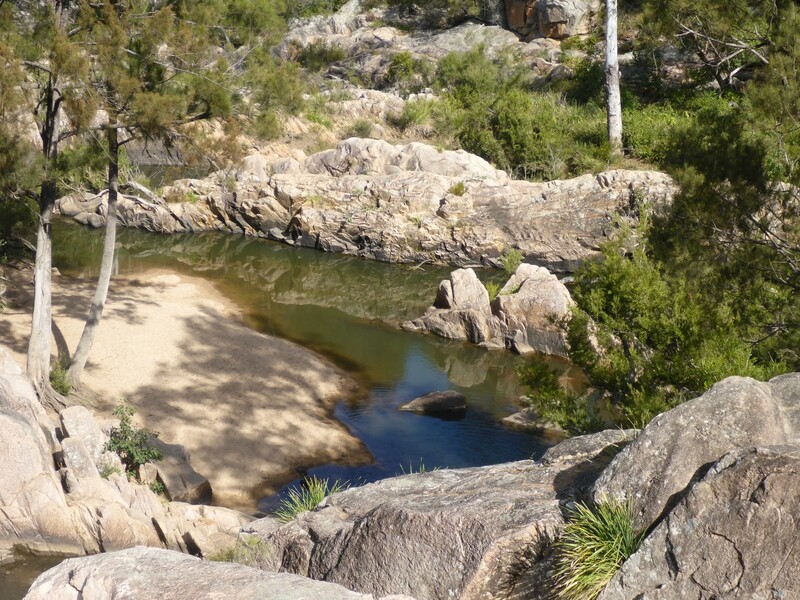 There is a creek that runs though their land and is formed into a pond by a dam, originally built by Chinese labourers in the 19th C for gold mining purposes. This should provide a reserve water supply but unfortunately the pond is mostly full of sand, driven downriver by the floods of 2013. Huge areas of Queensland suffered and Jim’s small corner didn’t escape. Jim is trying to find someone to take the sand away, at their cost but which will then free for them to sell or use. I think that’s what’s known as bartering. The track past their house was also washed away and has had to be realigned and remade. 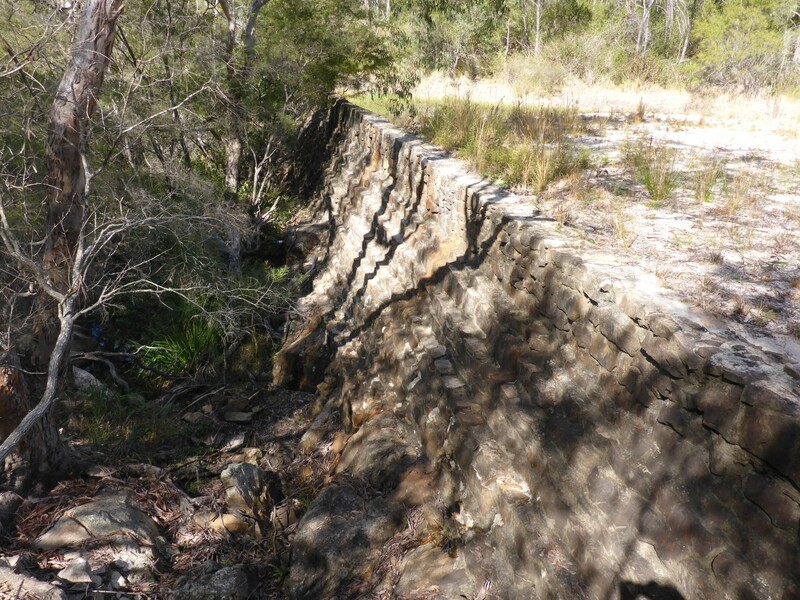 Chinese built dam wall. Note the sand where water should be. His land borders Crows Nest National park and we continued our walk on through there. It is famous for its granite formations, waterfalls and Rock Wallabies. Granite rocks and water falls are easy to locate but wallabies less so, and we were out of luck that day. The authorities have closed off some access points to the gorge, through which the river runs, after a young man died while swinging from a rope across it. Being a bank holiday weekend there were plenty of people about and we found some rubbish that had been left behind and took it with us. There’s an oddity here. The bank holiday is to celebrate the Queen’s birthday, and is usually on the second Monday of the month. Some states have it in September because the June date clashes with other holidays. So it’s important to Australians and yet in Britain we don’t bother. I thought this very strange until I remembered that we already have Whit Monday around the same time. Still, even as a republican, I’d be willing to give it a go! Jim was telling me that they get bush fires from time to time and he speculated that the granite in the area might attract the lightning that usually starts them. I thought he was probably right. Granite does tend to be metallic and it’s often left exposed at high points because of erosion. Either way, one of his ongoing jobs is to keep a decent fire break between the woods and his property. After a another great meal from Jeanette, I set to creating waypoints to my next couple of destinations. I wanted to follow some gravel trails, unlikely to figure on my standard GPS mapping, and got it all done successfully, with some tutoring from Jim. Phil and Trish had been to the cinema to see San Andreas Quake and enjoyed it. I managed to download a 2D copy and we watched it. I wish I hadn’t bothered! It really is appalling, with a weak, derivative plot, poor acting and a bad script. I guess its saving grace would be the special effects in 3D, but I really don’t recommend it. 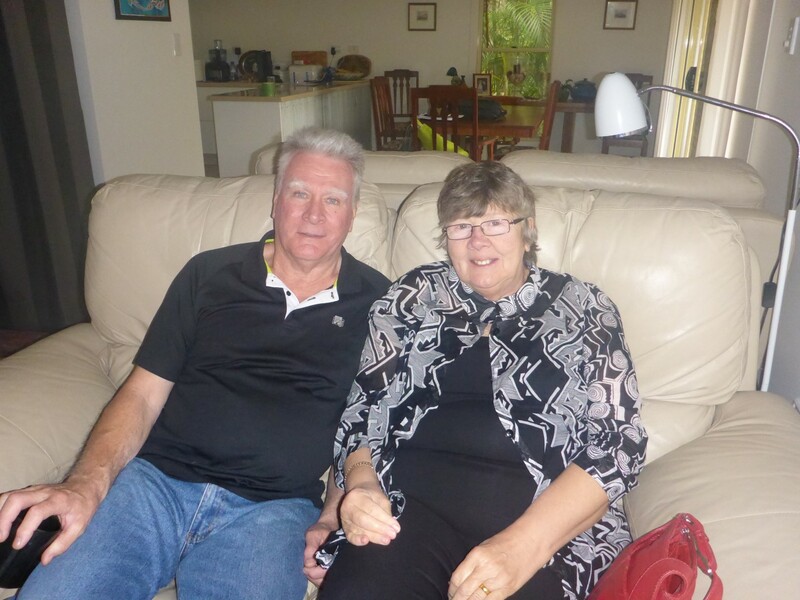 Fortunately Jim and Jeannette enjoy engaging in a healthy political discussion so we had a good time ripping apart Tony Abbott, Australia’s Liberal (same as the Tories but more right wing) prime minister. That was good fun. I’d had a great time up at Crows Nest and enjoyed their hospitality, but the time to go always comes along, doesn’t it? When I left next morning, having said my goodbyes, I was chased off the premises by Jim’s two dogs, Clancy and Jessie, who up to that point had been very friendly. And Jessie has only three legs! Not motorbike lovers, obviously. The trails have their fun moments. The Ozi explorer-to-GPS experiment worked pretty well, as I hit the cross country gravel trails on my way to Boreen Point, heading for the camp site on the shores of Lake Cootharaba. A few minor glitches popped up, with the GPS sending me in circles a couple of times while it tried to make sense of a waypoint I’d put in, but all worked out well in the end. Famous enough to have a road named after him. The campsite was run by the local authority and catered for all types of camper. There was no-one in the office so I put my tent up and got sorted out. When the office opened I discovered the charge was fixed at $24 dollars for two people with no discount for singles. That was dear. The woman glibly told me there was a cheaper one further on but I wasn’t about to pack everything up again. At least there was a phone signal there so I could use my phone to get on the internet, something that hadn’t been possible until I bought an Aussie phone card. A good decision. It rained overnight so while killing time waiting for the tent to dry I worked out another route using Oziexplorer, with a bit of help from Jim, via the phone. 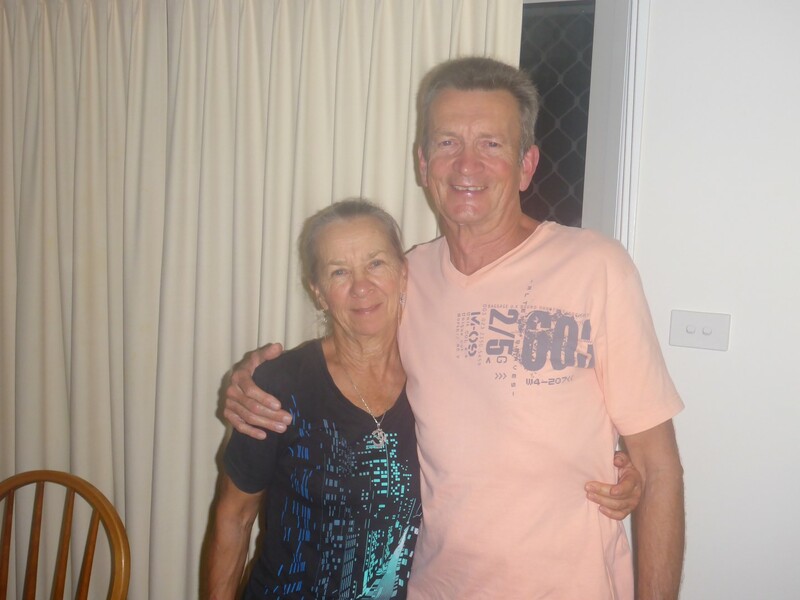 My destination was Woodgate Beach where I was to be spending a couple of days with Charles and Janette, friends of Jim and Jeanette’s. But trouble was looming in the shape of a GPS that kept losing its connection with the 12 volt feed from the bike. The GPS will run from its own batteries but they don’t last long. A slightly annoying problem, starting a few days before, had become a major issue. It didn’t matter with regard to reaching Woodgate Beach, but it was going to be a problem ongoing. Plenty of signs but no bears. I was warmly welcomed by Charles and Janette and shown to my quarters. Not a room but a small house. When they retired and bought the land they lived in this house while they built the new one, which they now occupy. It’s a handy place to stow guests and I was very comfortable. 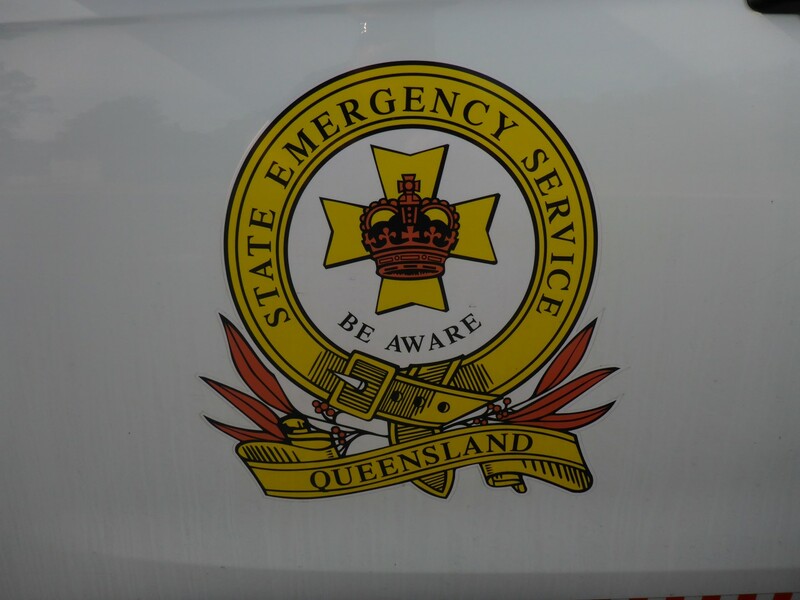 They have retired but spend a fair bit of their time as volunteers for the SES, the State Emergency Service. 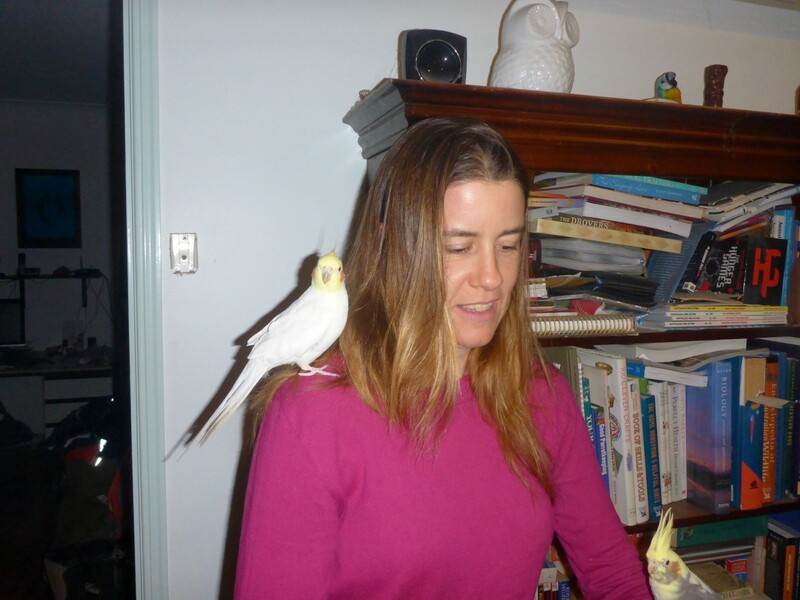 Janette organises various functions, such as training, Charles is a supervisor and is therefore kept pretty busy too. The state provides most of the equipment – vehicles etc. – but lots more is funded by the local community. The crews are all volunteers, most of them retirees, as far as I could tell, and they go to assist at emergencies such as floods, fires, searches and so on. This is community giving in a very real sense and must be very rewarding for all those involved. I was impressed by the whole operation. Jim is involved in a similar voluntary public service. 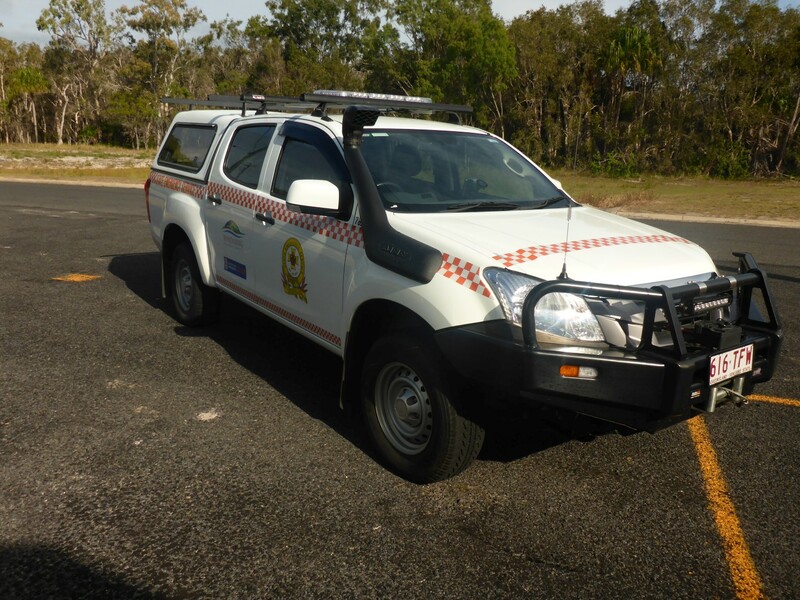 He is part of the Rural Fire Service for Queensland. And the vehicle that goes with it. This is a typical Aussie 4×4 Ute. We went for a drive in the Kinkuna National Park, where I learned more about various trees and also about the surface of some of the forest trails. Sand! Not to my taste at all but Charles and Janette assured me that most of the tracks I planned to ride would be firm and easily passable on my bike. I was pleased to hear it. 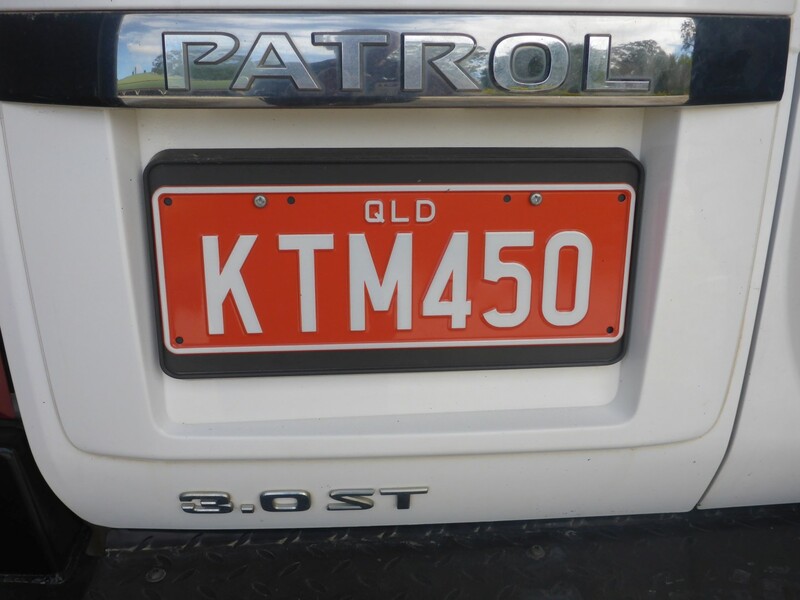 They’ve travelled extensively too, and exploring the outback in a 4×4 seems to be a big thing in Australia. The Gray Nomads generally stick to the asphalt and haul a big caravan to live in. I think getting out and exploring your own country is a fine thing to do. Well I would, wouldn’t I? We had a nice drive around the local area. One of the primary industries here is sugar cane growing. There are huge areas of this crop, stretching as far as the eye can see. 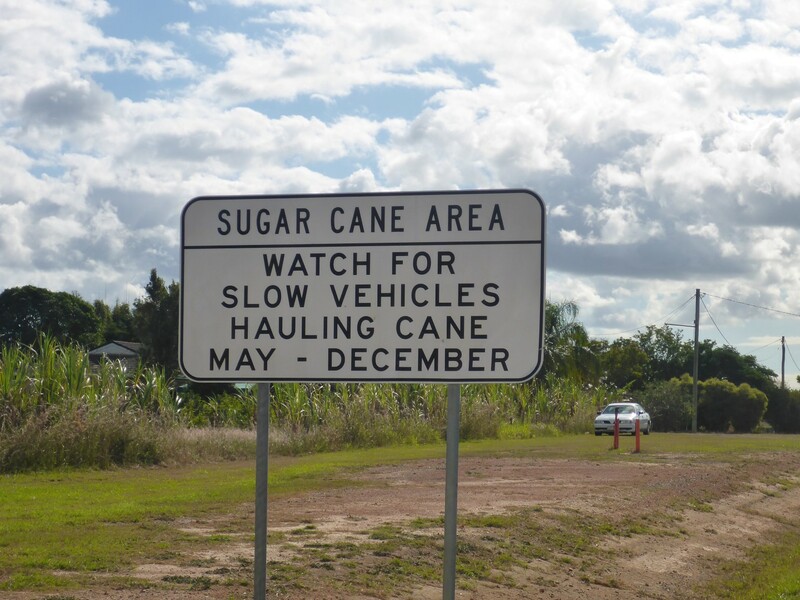 North Queensland has so much of it that there is a half-gauge railway network that enables it to be conveyed to the sugar mills. It is harvested by machine and put into wagons for transportation. Oddly, there are sections that have been cut, surrounded by others still growing. Charles explained that the sugar mills are co-operatives and they decide what areas to harvest and when. Home of a famous Australian rum. 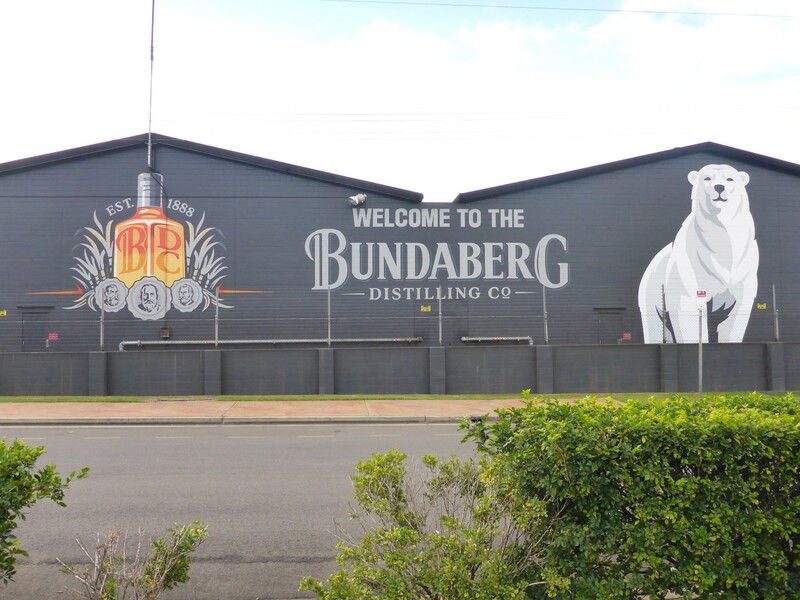 We went to the nearest big town, Bundaberg, where there is a rum distillery, which is very famous in Australia apparently. I was amused that it was across the road from the local sugar mill and round the corner from the cooperage. A thoughtful piece of planning on someone’s part. On the downside, this industry has a darker history. It relates to the Kanakas, a pejorative name given to South Sea Islanders, who were used as indentured slaves up until that system was abolished. Even then, they were persuaded to come to Australia to earn money, which was very often denied them after their three year service was finished. Under its ‘White Australia’ policy of the early 20th C the government repatriated most of these islanders, only allowing certain categories to remain, such as those who had married white Aussies. Charles pointed out a ‘Kanaka Wall’, which was made from the boulders these people had to clear from the land to make it usable. One of Australia’s stories of shame. Be careful at harvest time. When we got back Charles got his welder out and repaired the crack Phil and I had noticed in the pannier rack. Charles is an expert welder and used to sell the machines and train the operatives, among his many other engineering talents. I was in good hands. Meanwhile I tried to sort out the loose connection problem on my GPS. At first I thought it was the socket on the cradle mounted on the bike. But my efforts brought no reward. I’d had the foresight to buy another GPS while in the UK and when I substituted it, all was well. What a shame. I’d had that GPS unit since I went to Africa in 2009 but it had been getting more and more cranky recently. The time had come for its honourable retirement. Down at the sea turtle centre. 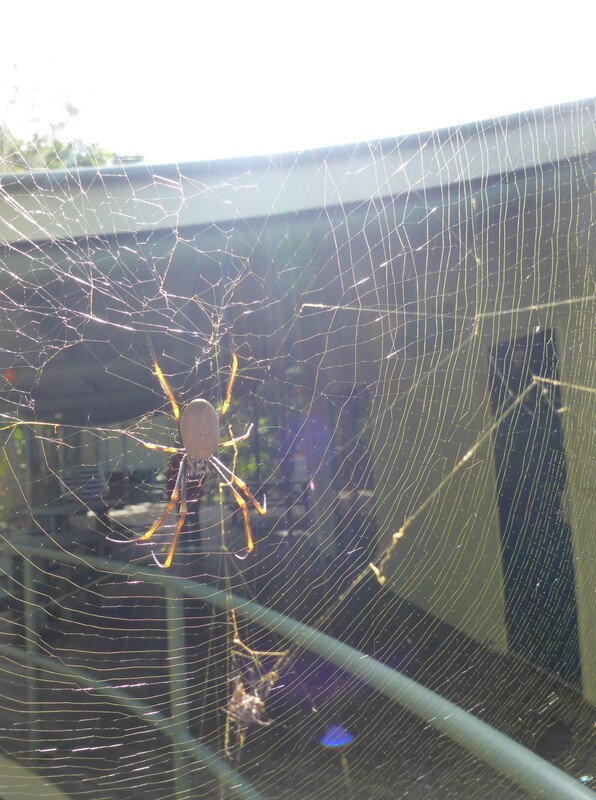 No turtles, but a big spider weaving its web. Because I’d used a toll road on the way to Jim’s I had made some enquiries with the road toll company, to see if I needed to pay it. I’m pleased to say that I received an email telling me it was too much trouble to attempt to collect tolls from foreign registered vehicles. They are always paid electronically, so over the phone or via the internet is the only way to pay. Good news, and a few dollars saved. 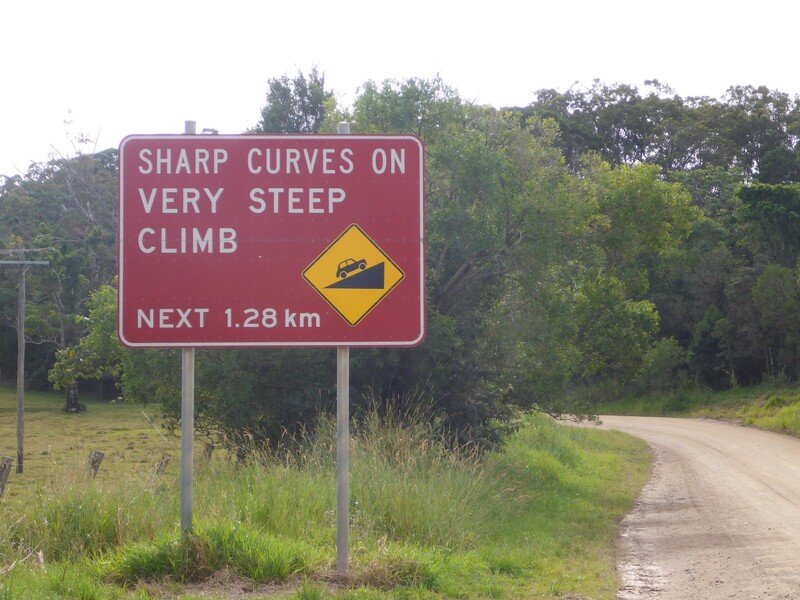 A common enough road sign. 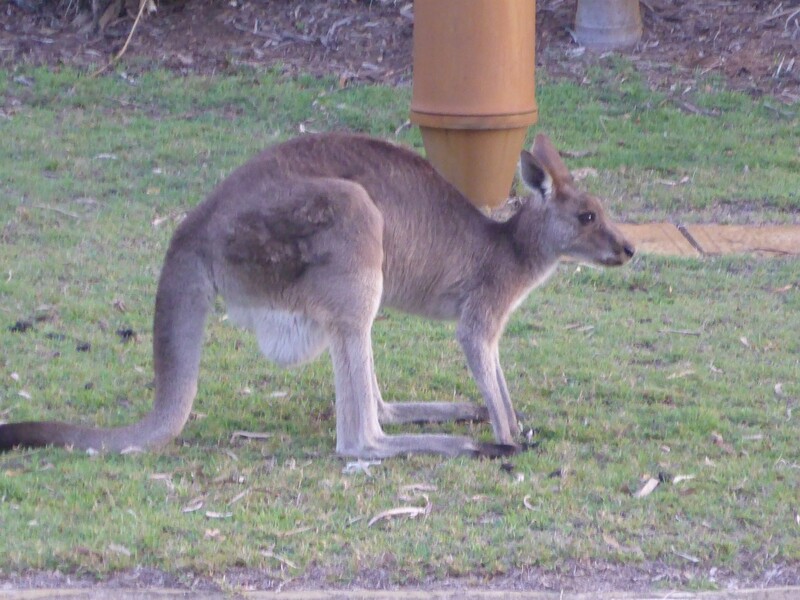 The previous evening, when out for a walk, we had seen kangaroos in the streets, a common sight as people tend to feed them. It makes them too tame and is as annoying here as feeding foxes is in the UK. There were none around this time. The real thing, seen in the street. In the evening we went over to dinner at a neighbour’s house. Harry and Eleanor are a great couple and have travelled pretty much all round the world. They prefer to backpack and, just to make me jealous, told me all about their trip to the Antarctic. We had a very enjoyable gathering with a very nice home cooked meal. I really feel privileged at these moments, being made very welcome by strangers and leaving with new friends made. Charles and Janette, great hosts. Charles and Janette had to leave for appointments early next morning so I popped back to Harry and Eleanors for ‘second breakfast’ and more travel chat. They make a lot of their own basic foods, such as a breakfast mixture made mostly from buckwheat. Very nice too. They asked me if there was anything I needed to aid my travels, a question that experienced travellers would understand the significance of. As it happened, I didn’t. They’d already fed me twice, who could ask for more? But I was very grateful to have been asked. The very well travelled Harry and Eleanor. My next destination was the town of Gladstone, where I’d been invited to stay with Melissa and Mitch. Melissa is Jim and Jeanette’s daughter and I was looking forward to meeting her. 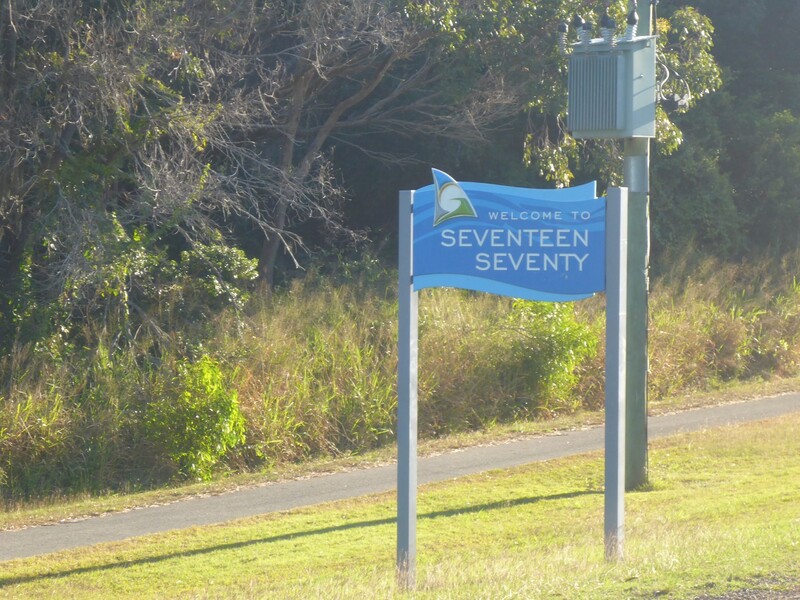 My route took me near to the town of Seventeen Seventy, named after the year that James Cook first sighted Australia. I’d never been to a town named after a date before so I felt obliged to pay a visit. It wasn’t actually anything special but there was a nice café near the seafront, where I bumped into Scott and Alison. 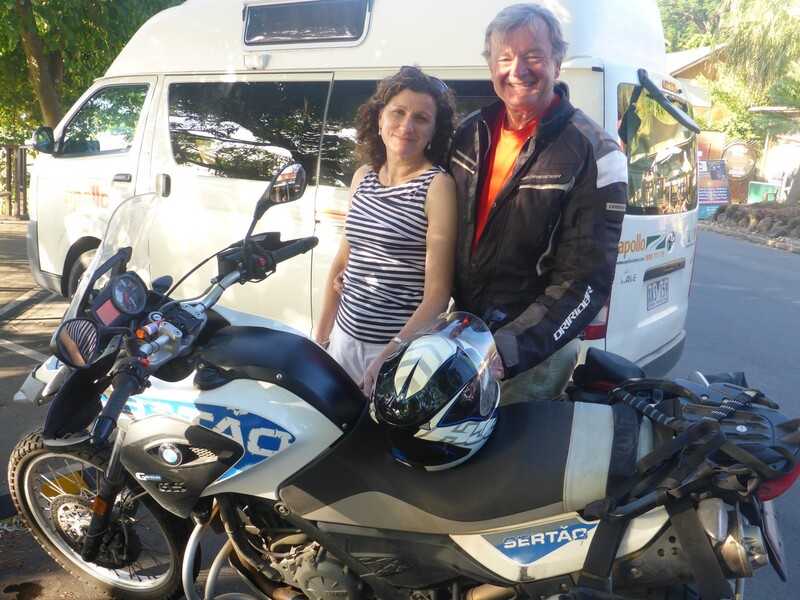 He was on his BMW650GS and Alison was in her car, on holiday. We enjoyed a nice chat about journeys we’d undertaken, and would like to, and Scott invited me to visit his medium sized station where he runs beef cattle. ‘Medium size’ equals a quarter of a million acres. That’s worthy of an exclamation mark! Named after the date that James Cook first sighted Australia. By the time I left Seventeen Seventy it was 15.45, with 130kms to travel. I’d done it again. But I was soon back onto the A1 and was able to push on at the 100kph speed limit and reached Mitch and Melissa’s before dark. And once again, I was made very welcome. 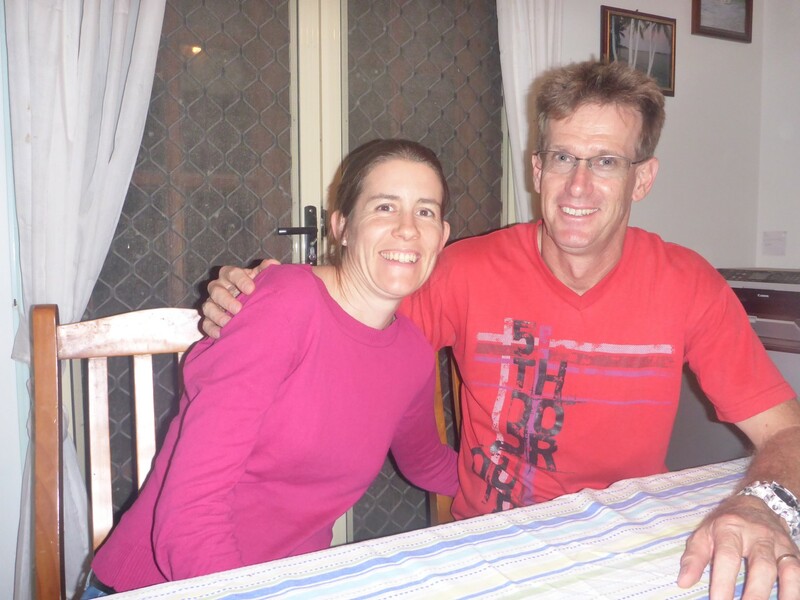 Mitch works at the local power station and Meliss is a teaching assistant. 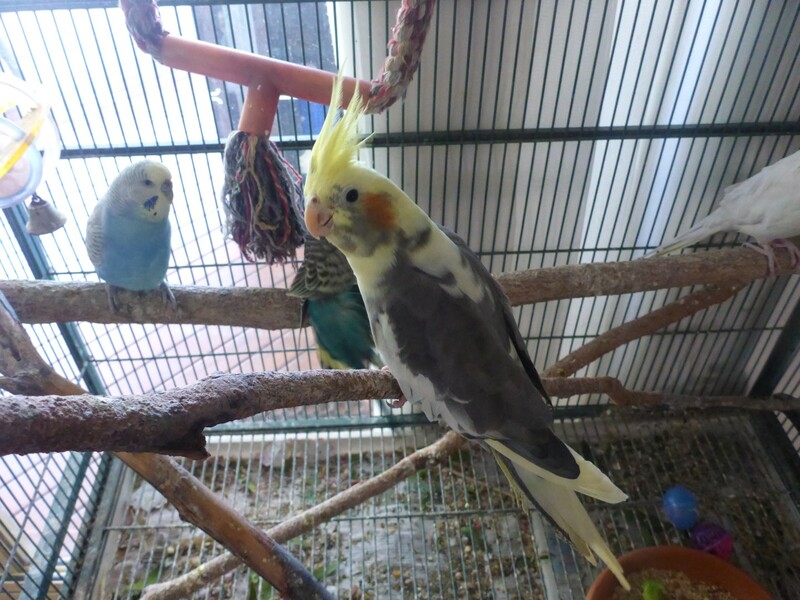 She’s also big on birds and has several different types of parrot, cockatiel and unidentified others in cages, both inside and outside the house. Mitch is big on bikes and has several varieties of KTM and Honda in the garage, a genus much more familiar to me. All of the bikes are off-road orientated and there are some for the kids too. There’s four of them, although I only met the younger two, Matthew and Sophie. She quietly gave up her bike after having a bit of an ‘incident’ involving a stuck throttle and a shed. No injuries but she now prefers to ride the pony, which is easily accommodated on their two acre plot. They bought the land then did what many Aussies do, which is to build a house to their own design. Mitch’s KTM990 has a 52 litre tank on it and this is the bike he uses for his annual trip to Phillips Island, off the coast of Melbourne, where he watches either the Moto GP or World Superbikes. He travels with a group of friends and over the years they’ve devised routes which are almost totally through the bush. We’re talking several thousand kilometres here. Australia’s like that. I met some of them when they came over for a BBQ later. One of the other bikes is a KTM450, in Super Motard style, which Mitch races locally. It’s not difficult to see what Mitch enjoys. Mitch came in from work at lunchtime next day and he took me out for a tour round. 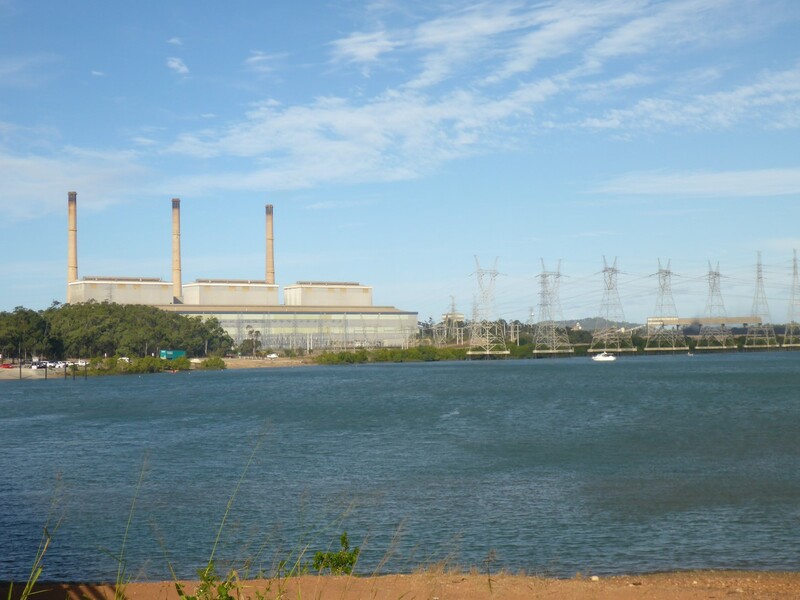 Gladstone is a place full of industry, the biggest of which is probably the Queensland Alumina Limited (QAL) plant, which dominates the seafront area. 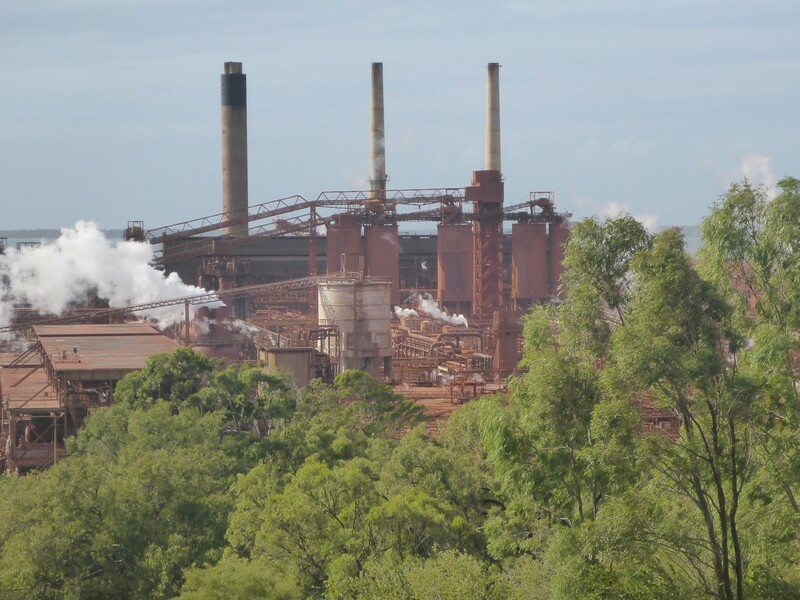 Bauxite is the third most common earth element and Australia has plenty of it, accounting for much of the red colour which typifies the barer parts of the country. It is transported to plants such as this in huge trains, anything up to two kilometres long, which often have six engines to move them – two at each end and two in the middle. Almost unimaginable, although I did see a similar train in Mauritania once, hauling iron ore.
Big and red. The QAL bauxite smelting plant. Other industries include a plant which produces explosives, hydrochloric acid and cyanide on the same site, something that would scare the pants off me if I lived anywhere near it. Coal comes in to the power station by sea and there is shipping and docks which support it all. Most of the land for the docks is reclaimed and the company that owns it has made many efforts to provide recreation areas close to the seafront for the townspeople to enjoy. The coal fired power station where Jim works. One of Australia’s biggest at 1800 megawatts output. A new, and very large, project is the construction of a gas storage and liquefaction plant on an island just off the coast. The natural gas will be piped 540kms from southern Queensland, then transported to export markets once liquefied. A lucrative business and Mitch told me it brought about a huge increase in the town’s population, some thing akin to the gold rush days. It struck me that this is a common story in Australia, with various types of mining bringing boom times to various towns, invariably followed by a massive slowdown as the mines dry up. It’s already happening in Gladstone. Thousands of workers, along with their families, came to build the gas plant infrastructure, pushing up property prices and rents, as well as swamping local services. They’re extremely well paid too, so have money to spend locally. But things are settling down now because the numbers have reduced as the work nears completion. Rents are going down again and the buy-to-let investors are struggling. Every cloud has a silver lining. More industry is on its way though, encouraged by some new infrastructure, as well as that which is already there. Generally good news for the area. That evening Mitch took me out again to show me the QAL plant by night, all lit up like a small city. I’m sure his power station bosses are very happy with that, especially as this one is privatised. On the way back we collected Matthew and friends from Boys Brigade, y taking me on a little trip down memory lane in the process. They still march and play bugles, just like I used to. Mitch and Melissa took many holidays with Jim and Jeanette on their 4×4 trips, as well as many of their own, and we spent the evening talking about routes and places to see. 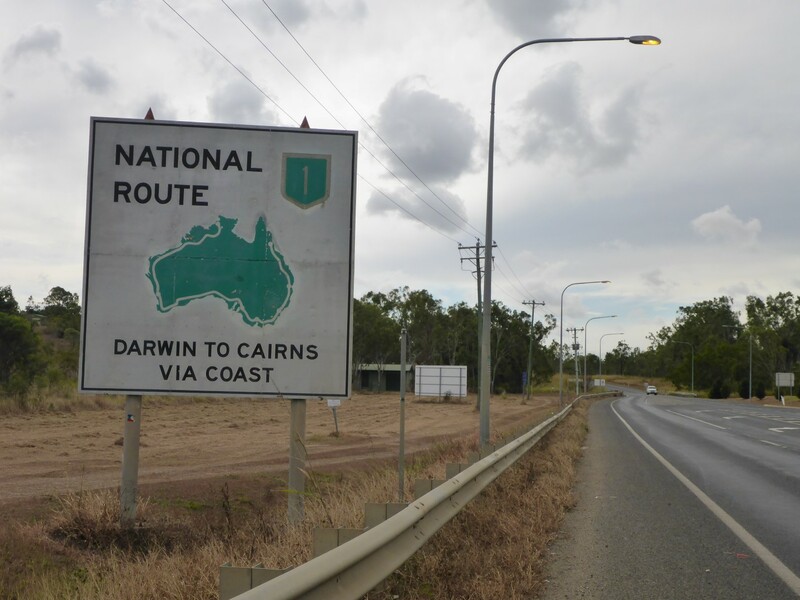 The first outback trip on my list is up to Cape York, at the northern and of the country, and I was therefore keen to listen to their advice as the road is mostly dirt. They reckon I’ll be OK as long as the water levels in the creeks aren’t too high. The road isn’t big on bridges, it seems. But the biggest warning was to look out for crocodiles. They’re fast and clever. Apparently if you go to the same place on the river bank a couple of times they’ll lie in wait for you. They can leap out of the water up to a couple of metres too. I’ll take these warnings very seriously, you can be sure of that. Mitch, Melissa and the kids went to work next morning, leaving me to sort myself out and leave when I was ready. 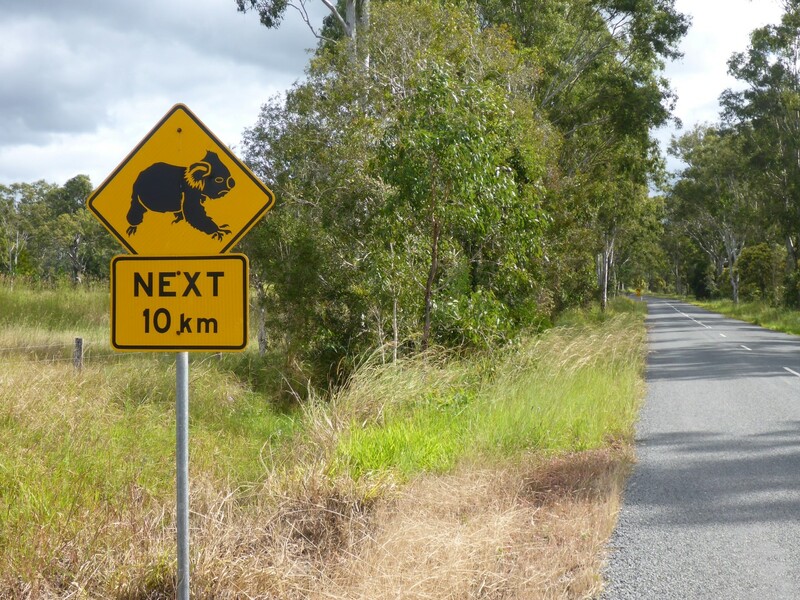 I headed back down to the Bruce Highway, fuelled up and moved on up the Mother Road once more. 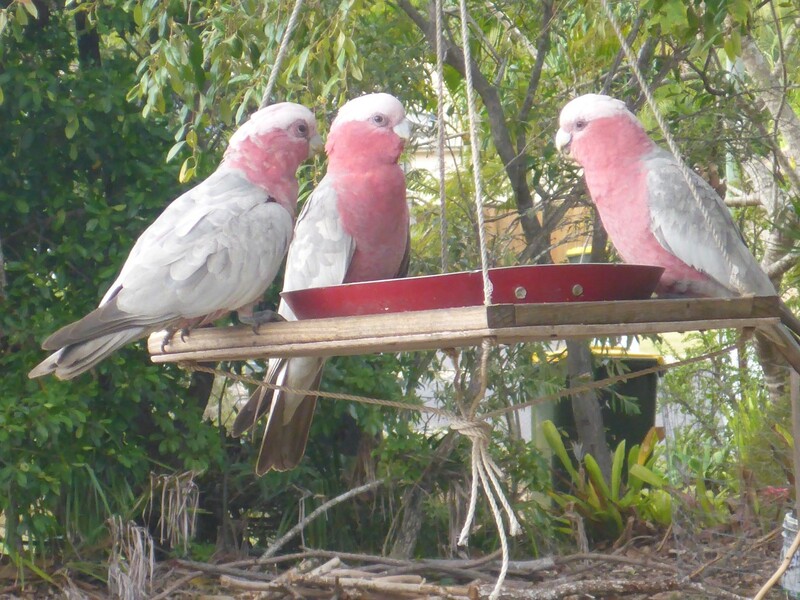 Three very pretty Galah Cockatoos. Quite common now in urban areas. Watch out for those crocs Geoff. You don’t see many if them in Dartford and they might surprise you! Scary but fascinating. Cheers Graham. No snappy incidents yet, but watch this space. Have a safe journey home. Hi Liz. Yep, all back safe and sound now. Here’s a couple of links that give sparse and somewhat incorrect details. You’ll be able to read the sordid truth in the blog after next. Alternatively try to locate next week’s Thursday Island Gazette on the internet and they’ll have better info as the interviewed me this morning. To summarise though, I went for a swim down the creek and did something really, really stupid. But all is well now apart from my very sore feet. Thanks for getting in touch. Glad you’re safe and recovering. Might be as well that Phil has your family contact details. I had to provide them, as much as I knew. In the end they got them from my passport, which was back in my tent, but it’s a good thought Liz. I hope to goand get my bike and bags tomorrow, all being well.